There are two benefits to using postcards when advertising your business. First, when you use postcards, it is cheaper to send them since the postage is less costly. Second, you will have a simple means of keeping your name in front of your prospective and former clients. It's advised that you make contact with your current and prospective clients every three months. Rather than picking up the phone (though you can do that too), you can simply send a postcard. Make sure your design doesn't confuse recipients. It should be in-line with your business. Make your business name prominent. Consider offering a discount or special deal if the postcard is mentioned. Write a note reminding your customers what your services or products are on the back side. Make sure to hand-sign the postcard if you want to give a personal touch. While you can certainly print postcards in your home office using a high quality printer designed for desktop publishing projects, you might want to consider taking your design to a print shop. At the very least, you'll want to be sure that you're using quality card stock and then trimming it using a paper cutter. The pre-perforated stock tends to have alignment problems, and you will also have a messy edge. While the images I've provided are configured for web use, you will want to make sure you save your image as a high-resolution file for printing. By doing this, you can avoid problems that may be experienced with blurry images or bleeding letters. If you've been looking for a different way to advertise a service that assists clients with organizing, taking on some of their mounting responsibilities, or life-coaching, you may want to consider using this postcard. 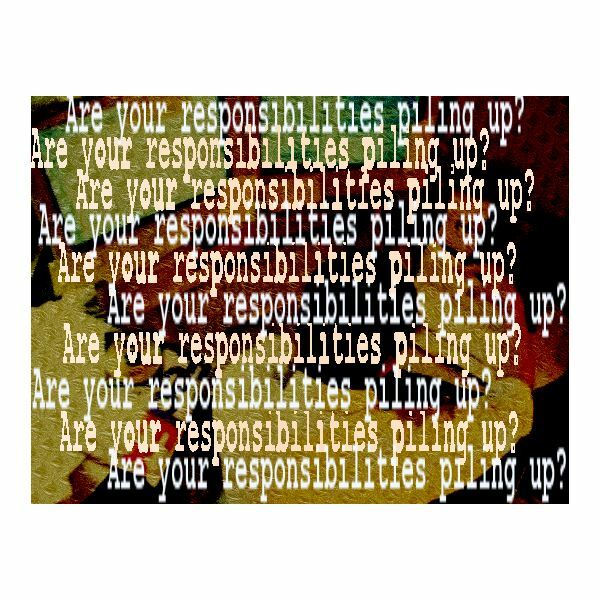 The postcard asks "Are your responsibilities piling up?" The writing appears on a layer over a background image of a man working at a computer. Everywhere there are stacks (even the words are stacked). To create this image, I used multiple layers. On the background layer, I first used the paint bucket to make the background a golden color. I then scribbled over this (on the same layer) using white "paint" and the paintbrush tool. Once this was done, I used the "Tile Reflection" effect to create an appealing pattern. I created a new layer and added my image. I then used the "color burn" image tool to make the background show through the image. Finally, I added the wording. If you wanted to add your business name to the front of the postcard, I'd suggest creating a filled shape on a new layer. Use the dropper tool to select a coordinating color from the background image to color the shape. Personally, I think an off-center name and logo would work best. Perhaps center it length-wise on the card, but have the textbox right justified. Don't play down the beauty of nature when you're marketing landscaping services! 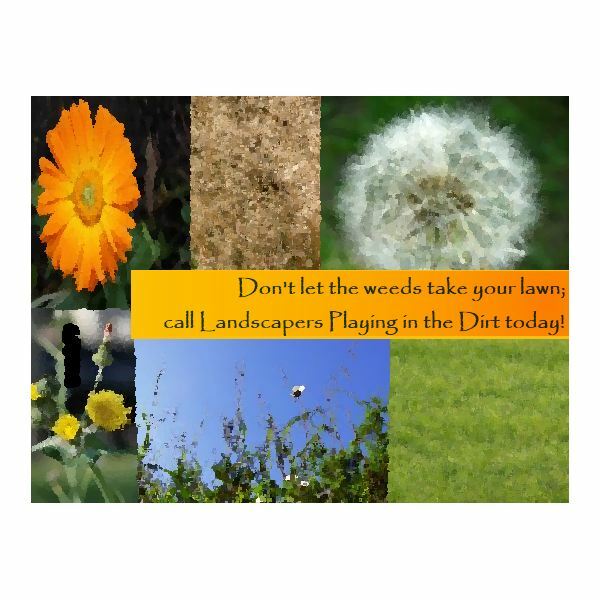 This bright postcard will help you to sell your services to homeowners and businesses who don't want their outdoors to look like the middle-top image on this postcard for those who enjoy playing in the dirt. Whether you're looking for new clients, or you're reminding existing clients that it's time to start using your services again, this card is sure to please. To make this card, I created a collage of images I downloaded from Stock.xchng. I didn't use the images as they were, however. I resized them, and then I compressed them onto one layer once I found a configuration I liked. Then, I applied the "oil painting" effect to give the postcard a dreamlike quality. You might wish to use the "ink pen" effect instead. I made the orange box in two layers. For the first layer, I used the paint bucket with a yellow I'd picked up using the eyedropper tool from the flower in the top right corner. For the second layer, I picked up the orange color from that same flower, but instead I used the gradient shading tool. I then used the "color burn" layer blend effect. If you run a business that offers services to homeowners, you may wish to use a postcard that commemorates this. Use this postcard featuring the image of a house to advertise. Whether you're running a home insurance rate special, or you're specializing in remodeling and restoring homes, this is a nice way to get the idea across. For this postcard, I used an image of a house, but then I partially cut it out from its background and pasted it on top of my stormy skies texture on a separate layer (see references for a link to this texture). Once I pasted the house, I used the lasso tool to further crop the image to eliminate as much of the background as possible. In order to eliminate the problem of having a shaky hand, if you're using a mouse and not a tablet, then lasso small sections at a time. 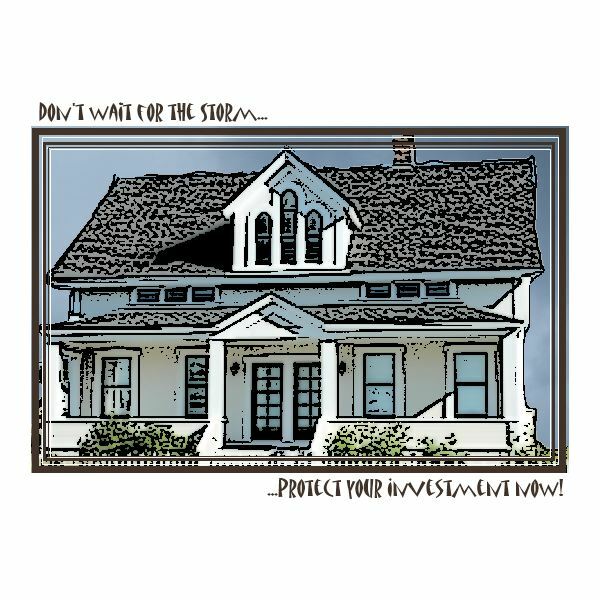 Once I had the image cleaned up as much as was possible, I used the "pen and ink" tool to give the appearance that the house was sketched onto the card. 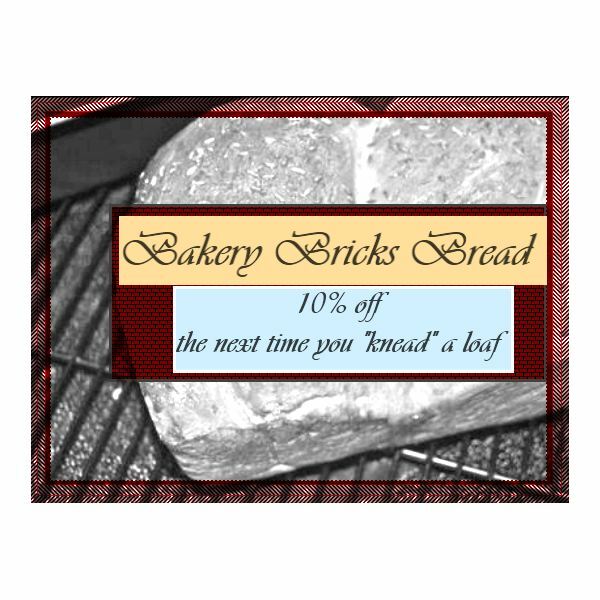 Use this postcard to advertise your bakery. When you include an image of the product you sell and a discount (especially when that product is edible), you are more likely to bring in business than if you simply were to send out a postcard. In the sample using the bakery bricks template, I've kept the wording simple. The backside of this card would then have the address of the bakery, and maybe a sampling of menu items. In creating this template, I used the "pencil sketch" effect to give a softer black and white feel to the bread. What's unique is the pattern fill. Rather than simply filling the solid color to fill in the postcard border, I selected both upwards and downwards diagonal patterns. For the bricks in the sample, I chose the brick pattern and used burgundy as the secondary color. Don't be afraid to play around with the fill patterns! The automotive industry can benefit by sending out postcards to current and prospective customers. 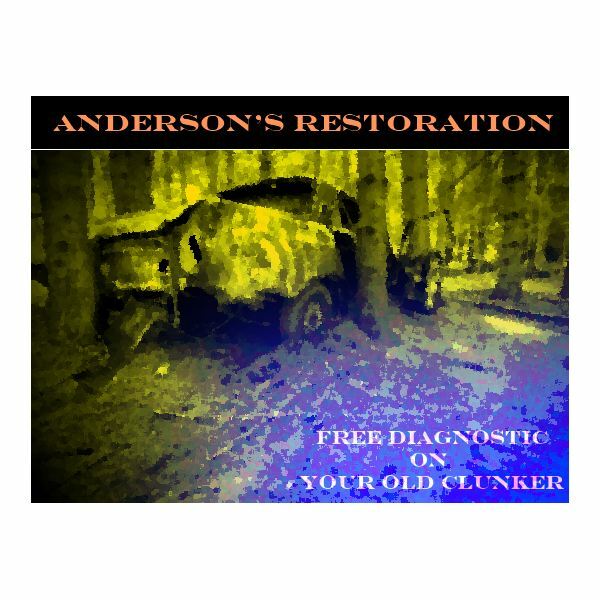 When it comes to reminding people to bring in their cars for a tune-up service, a postcard is a great tool. When dealing with new and potential customers, the postcard can offer free diagnostics, cheap services, and other incentives to get the business in the door and allow you to prove your skill. The automotive template was created using an image downloaded from Stock.xchng. The image was originally black and white. I used the oil painting effect to give it a softer effect; that way the sharp edges wouldn't distract from the name of the company or the free offer on the sample. I then created a new layer underneath the car image, and used the paint can to create a yellow fill. Next, I used a layer blending effect – "Darken". For the blue patch, I created a new layer, used the Gaussian blur effect, and then used a layer blending effect – Xor – to make it stand out in the corner. Using business marketing postcards can be an outstanding tool for increasing your business and satisfying customer needs. Maintain a list of prospective clients and customers to send your cards out to. If you wish, you can rotate your list, so that there's always postcards in the mail. Make one day of the week your marketing day and spend time with this project. If you do, it won't be long until you start seeing the results you want.